You’ve heard a lot about it, but you’re not quite sure what it is yet. If you were to ask most women how they would feel about having their face tattooed there’s a good chance you’ll be called crazy. Yet, those same women would be quick to tell you how much they would love picture perfect eyebrows that don’t need a single second of attention or cosmetics. That kind of sums up microblading. Essentially, having your eyebrows microbladed is having a tattoo on your face. There are a few major differences between the two, though. Once upon a time, people shaved their eyebrows off and then had thin, crayon-looking lines tattooed in their place. It was definitely an era that most women would rather forget, especially those women who went and had this done. It may have saved them time, but it certainly didn’t provide them with a natural looking brow. Microblading results in natural looking, perfectly shaped eyebrows. You get bold brows that last between a year and three and you save time and money while you’re at it. Before you panic, know this – there is no tattoo gun involved here. Your technician instead will use a small tool that looks a lot like a pen. Small incisions are made to resemble the surrounding eyebrow hairs before pigment is deposited. If you’re thinking it sounds painful, don’t worry. Before the technician makes any official moves they will apply a numbing cream to the area so you may feel the work being done, but you certainly won’t feel pain, just a bit of discomfort. You may think this is a con, but it really is a pro. The semi-permanence of microblading means that you can still stick with the trends and make changes as you wish. You will need a touch-up within a month or two of having your initial session, and if you want to maintain your look you should have a touch-up every year. How well your results last will depend on a couple of factors. Firstly, how much time you spend in the sun, the products you use, and how well you look after your skin. If you exfoliate too much it could affect your brows and if you don’t apply sunscreen regularly… well, you get the picture. Secondly, the color matters. The darker the brows the better they will hold. So, if you’re blonder you may need more maintenance. 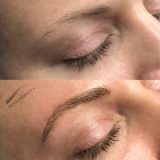 if you are someone who has over-plucked your brows, experienced hair loss, has gaps or needs to reconstruct your brows… then microblading is the perfect solution for you. However, there are certain conditions that mean it’s not the right fit for you, so if you have a skin condition such as dermatitis, eczema, rosacea or psoriasis you’ll want to give it a miss. Additionally, pregnant women should avoid having the procedure done and if you have an autoimmune disorder you should speak to your doctor. It’s vital that you choose a clean salon with well-trained and experienced technicians. Having the procedure completed in a non-sterile environment could result in infections.